Has anyone else noticed that the stamps released thus far by the United States Postal Service reflect a clear bias? Perhaps it should come as no surprise that an agency of the federal government would favor the United States during the Civil War. 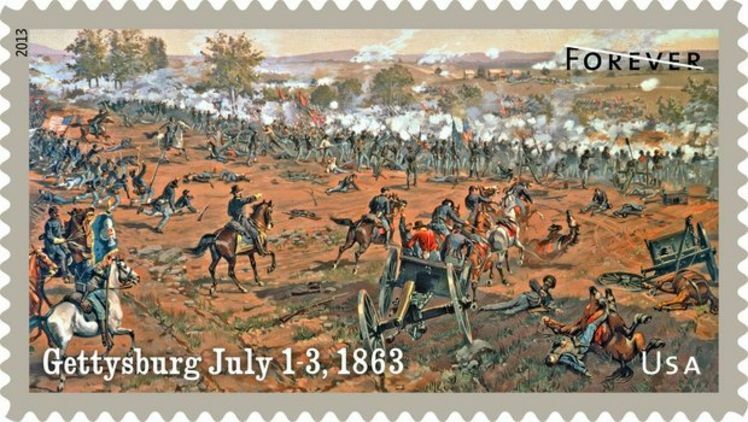 Next month the USPS’s Forever stamp marking the 150th anniversary of the battle of Gettysburg will be released. It is based on Thure de Thulstrup’s 1887 chromolithograph and once again depicts the Union line as opposed to the more popular Confederate perspective on July 3. Stamps marking the anniversaries of Bull Run and Antietam also features Union positions while the New Orleans stamp features Union gunboats. And let’s not forget the Emancipation commemorative stamp. I suspect that this bias is intentional and that it will continue to the end of the sesquicentennial. We may not see a Rebel until we get to Appomattox. At this rate I am willing to wager that they release a stamp marking Sherman’s March? Did I suggest that this should bother anyone? I am simply making an observation. The mere fact that you asked the question was bait. I know the difference. I really do like the stamps. At first I would not use them, as I wanted to keep every last one. I am getting a set to keep for history. This doesn’t really surprise me at all. I think that’s how it’s been since Gettysburg. The preservation of the park has been in a severe bias, too. That’s what comes with the territory of which side won each battle, the war etc. Nothing wrong with showing Hancock’s Defense. Winners! The real reason the Civil War was fought; The south tried to the Yankees that they were better than the blacks during that period but the south lost. Interesting observation. Though the Bull Run stamp does show a Union rout. Winners write history, right? These stamps are fantastic though. Lets just be glad they’re marking the occasion at all. I’m sure another batch of nice puppy or kitten stamps would be more profitable. We at the United States Postal Service will pick and choose whomever and whatever we want to commemorate and be darned if anyone else has to like it! If you wish to complain about what is depicted on any USPS stamp, write the Post Master General in Washington, D.C.
USPS employee since October, 1999. 1) The USPS selected stamps based on how pretty they looked or the artwork involved. I highly doubt that the postal service sat around talking about historical bias & memory when selecting artwork. That’s not to say they shouldn’t. 2)Even if they had, supposedly one of the ‘goals’ of the 150th is to introduce new audiences to the Civil War, and not just cater to the traditional Civil War crowd. For the last 100 years the mainstream historical memory of the war has been greatly influenced by the southern view – it was a war of states rights not slavery, southerners are the heroes (lee, jackson, etc…) while northerners were the butchers (grant, sherman). So if one of the goals is provide a new perspective on the conflict, many of the stamps probably will have a decidedly Union perspective because, despite repeated claims that ‘history is written by the winners,’ the Confederate memory of the war has been the dominant one for most of our lifetimes. In this particular case it’s taking a well known event – Pickett’s Charge – and showing it from a new perspective. And I see nothing wrong with that. Lumping this in win with the Emancipation Proclamation stamps as painting a picture of clear Union bias is a little misleading as well. The Emancipation Proclamation was one of the defining moments of the war. And quite frankly the “Confederate perspective” of that isn’t all that pretty – maybe a lithograph of Fort Pillow? I suspect that a bit more thought went into the selection of images than you give them credit for, though I can’t prove it. I included the EP stamp as evidence that the war is being framed as a national cause with emancipation as one of its important milestones. It’s obviously all speculation, but I suspect selecting images for stamps is a lot like a school board selecting textbooks. They get their one “history person” in there and they give them a nice story based on whatever they selected for other reasons – it’s pretty, the copyright for the image was cheap/available, etc… As an employee of the Federal government I can assure you that I’ve never once been told “Hey ‘we’ won, so this is the view you’re supposed to take.” I doubt that happened in the postal service of all agencies. And if we’re framing the war as a national cause with emancipation as an important milestone, there’s no way they could have a “pro” Confederate stamp. If the Union perspective is that of liberty and emancipation then the Confederate perspective is that of slavery and disunion. I guess what I’m getting at is that I don’t see their stamp selections as an issue because they both represent different perspectives than what the general public’s collective memory is used to. I concur with Kevin that a great deal of thought went in to choosing the sesquicentennial stamps. I have been a bit of a philatelist my whole life and must say that I think they’re doing a good job with the Sesquicentennial commemoratives. At least we didn’t get saddled with those ghastly pastel-colored and cartoon stamps we have seen in recent years. Each year set of two stamps has a classic look to it, and is easily recognizable as being part of the larger whole of the Sesquicentennial series. In addition to buying a sheet I would recommend getting First Day Covers for each stamp in the 2011-2015 run. Thanks, Keith. Nice to know my speculation isn’t too far off. What about the Fort Sumter stamp? Wasn’t that from the rebel perspective? What? You want stamps glorifying treason? P.S. Some people (specifically, some of your Commenters) have no sense of humor. That’s a shame, as it prevents them from enjoying yours. The “old man” thinks that the USPS is praying that they can make a little money, cashing in on the 150th, before the whole Postal Service goes broke. Perhaps a stamp of Justin Bieber would have been a better choice in that case. Both of you are being a little tongue in cheek, but are actually closer to the truth than you might know. The USPS has been issuing commemoratives for decades, as they should. A country’s stamps say a lot about its history and people. At the same time, postal authorities realize this can generate income as well. When people buy commemorative stamps, especially full sheets, and stick them in a drawer never to be used that is just found money. They were especially successful with the Elvis stamps issued 15 or so years ago. It made me go back to an old sheet of stamps I had saved. In 1994 there was a set of 20 stamps on Civil War themes released. You had the Monitor and Merrimac, Shiloh, Gettysburg, and Chancellorsville. In the three battle scenes you got Union troops at the Hornet’s Nest, a scene at the angle during Pickett’s charge centered on a Union soldier with his musket raised above his head, and for Chancellorsville a Union cannon trying to slow the Confederate advance. The rest were historical figures. Lincoln & Davis. Lee & Grant. Joe Johnston & Sherman, Jackson & Hancock, Farragaut & Semmes. Then you had Harriet Tubman & Mary Chestnut, Frederick Douglas, Clara Barton& Phoebe Pember, and Stand Waite. I had a poster of those stamps on my classroom wall in C-Ville. I have that sheet mounted, framed and on the wall of my home office! Kevin, “clear bias” is only in the mind of the beholder. The postal service in 1948 produced a UCV stamp with the GAR stamp. The Stone Mountain carving of Davis, Lee, and Jackson was on a stamp in 1966. That makes at least four stamps with Lee on them. The Civil War issue of 20 stamps was very balanced. Would you prefer Southern victories of Chickamauga or 2nd Bull Run to represent 1863? They pale in importance to Gettysburg and Vicksburg strategically and historically. I like the series and am glad they are doing this instead of another set of clouds or flowers. You are reading way too much into my post. I wasn’t expressing approval or disapproval of the selection. I was simply making an observation about their choices. There Kevin, I fixed it! Glad to know you and yours are safe and well. I do love my hometown! We are a bunch of tough bastids!!! The terrible irony for me is I spent 14 & 15 April at Gettysburg and Antietam with my brother’s Scout Troop from Milton leading them on a tour of both battlefields. I spent Sunday explaining the tenacity of the 20th MA VI at Pickett’s Charge and Monday the courage of the 28th MA VI at The Bloody Lane to these young men from outside of Boston. I left the group at 2:45 on Monday and headed home to Southside Virginia. I was listening to 98.5 FM through my IPhone App when I heard about the explosions as they happenned. I immediately called my brother and told him. Of the 14 young men on the trip 5 had family members running the Marathon…all are well. It was way too much of a practical applciation of the courage and tenacity as explained to them about 19th Century Bostonians that those young men got to see it repeated in the 21st Century. Next post: What Can Holocaust Memory Teach Us About Civil War Memory?